Do you want your Photogize kiosk running in peak condition all year round? Then it’s time to hire Photogize KioskCare as your new helping hand. KioskCare is like having a new IT employee on staff, yet KioskCare’s monthly cost is less than what some IT staffers spend on coffee. See how KioskCare leverages the cloud to deliver you a bundle of EIGHT Photogize IT services, including best-in-class remote diagnostics, Photogize backup and restore capability, new software updates and patch management, hard disk preventive maintenance and more. KioskCare uses CloudBerry Backup and Amazon® S3 to continuously run real-time backups of critical Photogize software settings, and recent order data to the cloud. To start, we review together the exact files we’ll back up If a catastrophic event occurs, we’ll be right there to retrieve the latest data from your cloud-based backup account and get you up and running again as quickly as possible. We automatically download and install all Photogize software updates within 48 hours of release. And we make sure that all license-appropriate optional Kiosk templates are installed. Most importantly, in most cases we will run your updates in your OFF hours, and not when customers are in your store. KioskCare is a comprehensive catastrophic disaster recovery service, including technical failures (e.g. hard drive crash or other fatal PC failure), and natural disasters (e.g. fire, flood, tornado etc). We will fully recover and restore your Photogize application software, retailer-specific settings and recent order data. You only need to supply the replacement PC with Microsoft Windows® 7.x or 8.x installed. Our KioskCare technicians believe preventive maintenance is key to your PC’s performance. So once a year we’ll Defrag your PC hard drive and remove temp files. Your PC will purr. Thinking about upgrading to a new Windows System 8 PC? Not a problem with KioskCare…we’ll do it for you. Your KioskCare service includes one pre-planned Photogize system move per year. 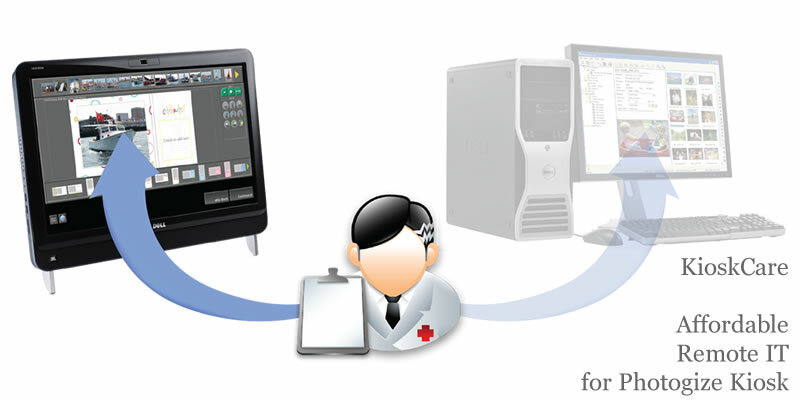 When you enroll in KioskCare we’ll install our ReadyRemote software on each enrolled Kiosk PC. This enables us to remotely service your PC day or night without requiring your staff to assist us in starting a remote KioskCare session. Free up more staff time for servicing your customers while we manage your IT tasks. Think of the TIME you and your staff can save! No more mucking around with disk drives that slow down, PC systems that freeze up, and frequent software downloads, updates and reboots. That’s a real cost to you…measured in thousands of dollars every year…that also takes you away from servicing YOUR customers. Start saving today by adding KioskCare in your lab.